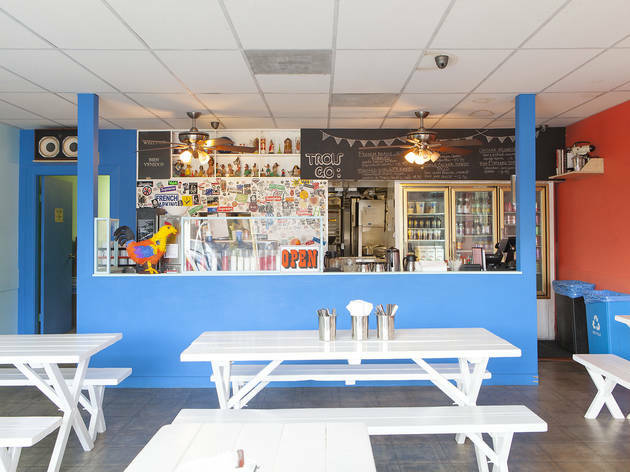 Line up for brunch at Trois Familia in Silver Lake, where you'll find Mexican and French fusion in a colorful, quirky setting. 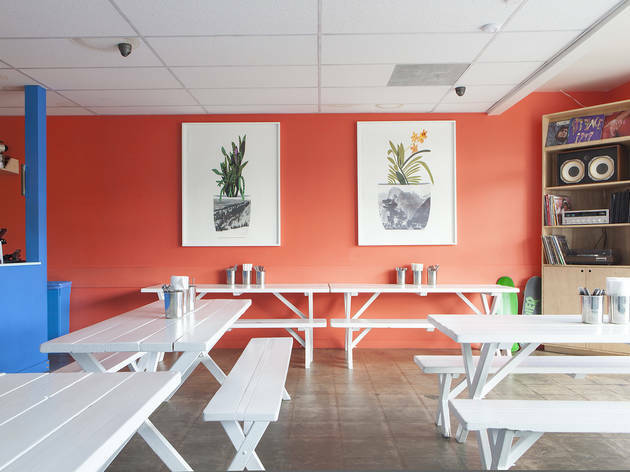 Leave it to LA’s most well-known culinary trifecta to finally enter the brunch game. I’m talking, of course, about Ludo Lefebvre, Jon Shook and Vinny Dotolo, who have given us Petit Trois, Trois Mec, and bona fide cult classics like a perfect omelette, the Animal burger and a fantastic plate of meatballs. 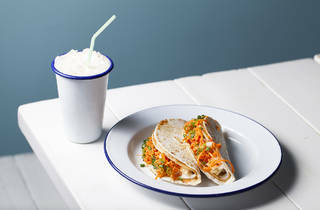 At Trois Familia, a French/Mexican cafe specializing in breakfast and lunch, there are already dishes poised to achieve similar acclaim, including a pair of double decker potato tacos, crisp with lime and carrot pico de gallo. 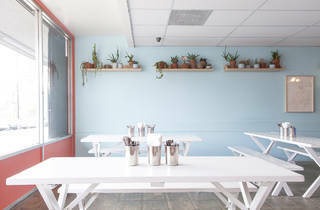 In fact, there’s a lot to love about this place, from the casual and colorful decor down to the scoop of Salt & Straw ice cream dumped on top of a French toast slice. Scoring a seat here is fairly straightforward: write your name down on a clipboard, get in line and wait to be called (or, you know, just arrive early). 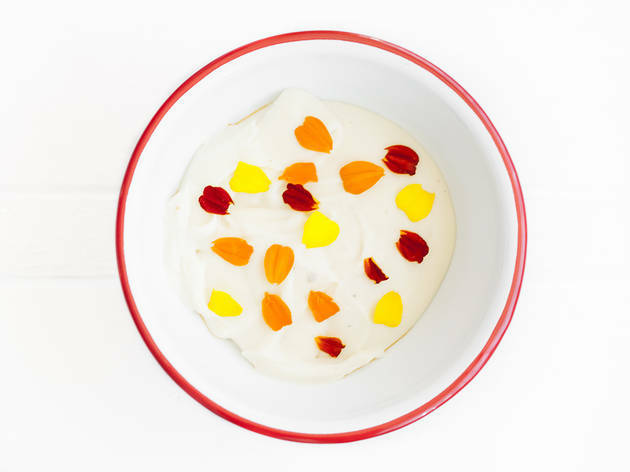 The service is friendly and punctual; sitting at Trois Familia’s white tables surrounded by walls drenched in primary colors, it almost feels like you’re at a family picnic. 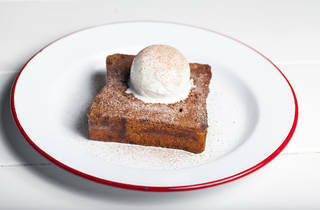 But the dishes—both sweet and savory—are a reflection of the culinary pedigree backing this place. 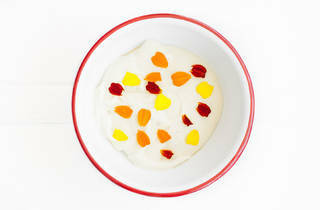 On the initial menu, a poached egg could be found hiding under a pile of whipped potato mousseline, topped with a sprinkling of marigold flowers that lent a fine-dining touch to the dish. 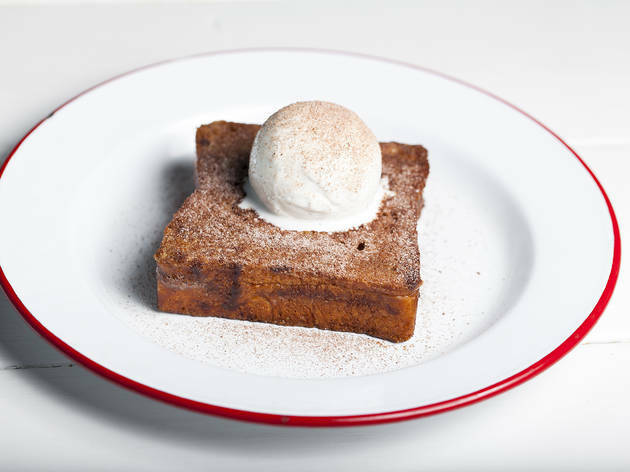 The French toast is of the churro variety, elevated with artisan ice cream and Mexican chocolate. And those potato tacos are among the best of its kind in LA at the moment. At two to an order, they’re perfect for sharing. Which leads to an issue at Trois Familia that I found hard to wrap my head around. This is breakfast and lunch food—do we really need to extend the small plates ethos to this time of day? Sizing is varied and unpredictable: order the French toast and you’ll just get one slice, which is not enough to share but, at $9.75, should be. 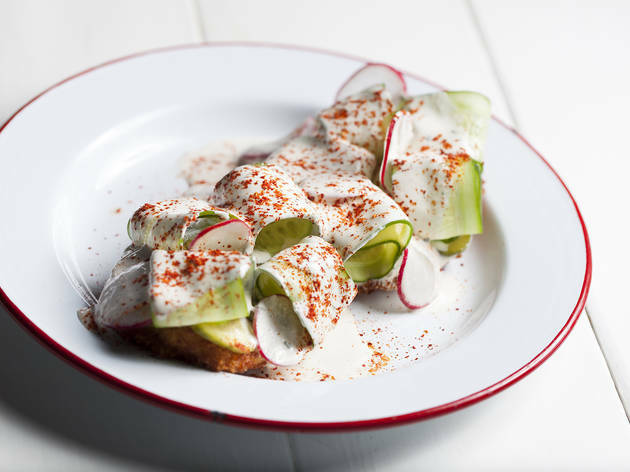 The chicken milanese, smothered in pickled cucumbers and a little too much maggi ranch, is just enough to share, but spend $11.95 on it and you almost feel like you should be getting more than your few bites. We’ve finally accepted that going out to dinner involves sharing all your food; must breakfast require it, too? Despite my frustration with the portion sizes, I had those potato tacos on my mind for days, and will most certainly come back for them. And I’ll put my name on the clipboard, wait in line and order enough to share. There are some things you just can’t fight. 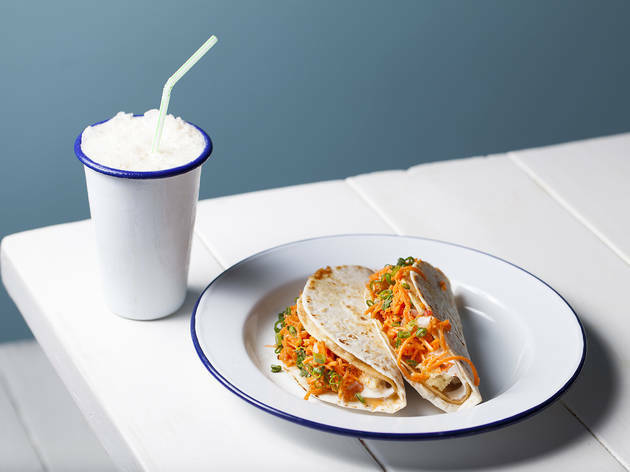 What to Eat: The potato tacos ($12.50). The French toast ($9.75). The poached egg with chorizo jam ($10.85). 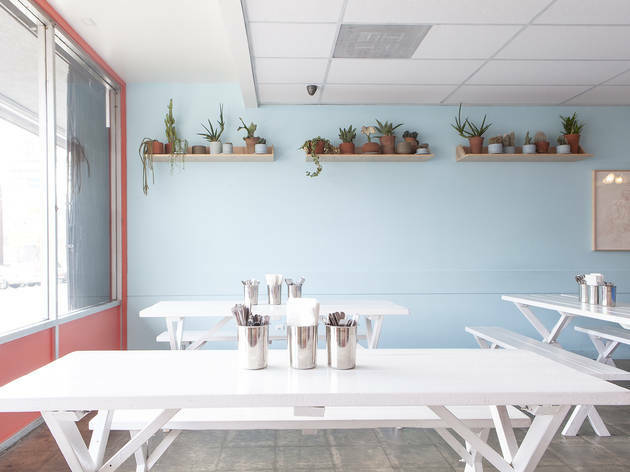 What to Drink: You’ll want to order horchata ($6)—or if you’re looking for more of a pick-me-up, the cold brew latte with horchata ($7). 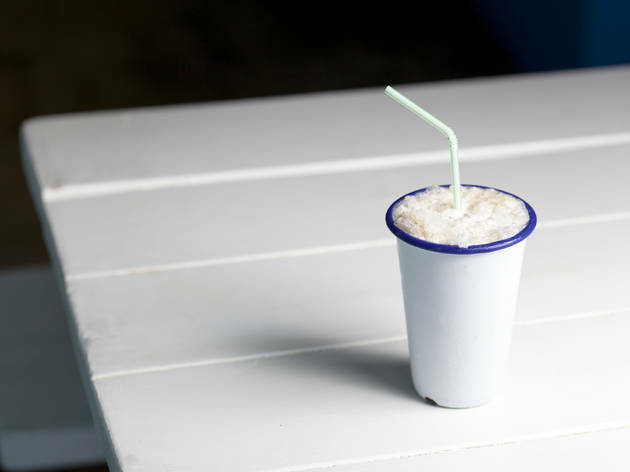 The rice drink is thick, creamy and indulgent, and though I found my glass to be mostly filled with ice, horchata is not something you want too much of. 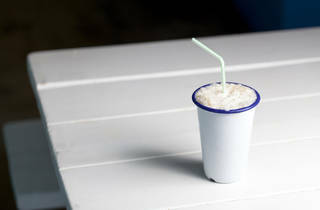 Though that price is hard to swallow when you can get great horchata at a taco truck for $3. Where to Sit: It’s a communal affair here—a few tables fill the room, and you’ll just have to get cozy with the group next to you. 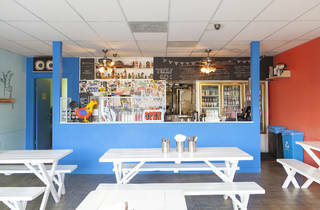 Trois Familia is what I want from a brunch spot - bright, cheery, fun - and the food is consistently delicious. They could probably invest in better coffee service since it's a morning-only operation and people like coffee, but then again, you can grab one from one of the other neighborhood shops to sip while you wait outside for your table to become available. Love Ludo&Krissy they have the best partners in all the location of Trois group. This is the cutest place! 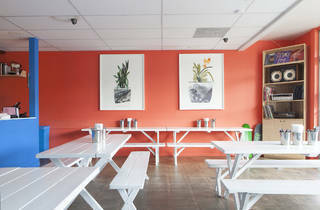 The bright colors and communal seating give it a fun, friendly vibe, and the staff are jovial and helpful. 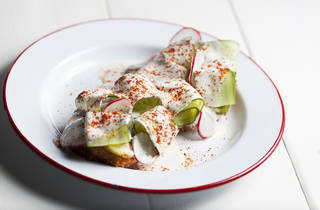 The food is inventive and good for sharing—my favorites are the chorizo crepe and the chicken milanese, which, despite what other (clearly mistaken) reviewers here have said, is perfectly crisp, with a mouthwatering blend of flavors and textures. Not a traditional brunch food, but a crowd-pleaser every time I've been. Food was fantastic, wait was only 10 min at noon on a friday. Price came out to $68 after the included tip, did not order any beverages. I really enjoyed my meal at Trois Familia. The dishes are fun and unique twists on a number of classics. The double-decker tacos are definitely the standout. Unfortunately other dishes, like the chicken milanese, fell a little flat. It lacked substantial flavor and was absolutely doused in sauce.